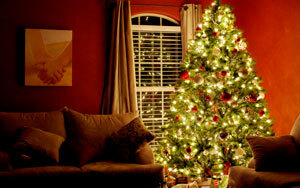 Putting lights up and decorating the tree are holiday traditions that many families enjoy at this time of year. Holiday decorations can warm up an otherwise dreary environment but there may be some unexpected consequences to dressing your home up with some holiday cheer. Pests of all types have been known to get riled up as a result of all the commotion putting up holiday decorations causes. Pests that are common to the Greater Boston area generally prefer to make their nests in area that are out of the way. Spaces like attics, closets, storage areas, crawlspaces, and garages are all places that our team removes pests in Boston from. Pests hiding out in these spots can easily be agitated during the process of decorating for the holidays. Pests that have been disturbed will panic and try to relocate, making their presence known to the inhabitants of the property. Boxes full of Christmas decorations make ideal locations for pests to live because of they are able to provide shelter and are often easy to gain entry to for pests of all types. To avoid any unwanted pests as a result of Christmas decorating the best thing to do is to examine all holiday decorations for pests before they are put up. If you do find any pests in your decorations you should get rid of them immediately. You may be able to remove the pest you found yourself but it is impossible to know if there are any eggs hidden somewhere in the material that can lead to bigger problems down the road. Nothing is worse than being disturbed by a Boston infestation that you thought had been dealt with awhile ago. If your holiday decorating uncovers a threatening Boston pest infestation the best step to take is to call NW Pest Control. NW Pest Control offers the highest-quality Boston pest removal services in the region. Our trained technicians are experts in local pest biology and habits and use this knowledge to find and identify pests fast. We offer free on-site estimates so we can get a feel for the size of the infestation you are experiencing and can offer you an accurate quote for our services. Get Boston pest removal done fast with expert service from NW Pest Control.